Having borrowed this picture from Facebook, I wanted to credit the organization I borrowed it from. 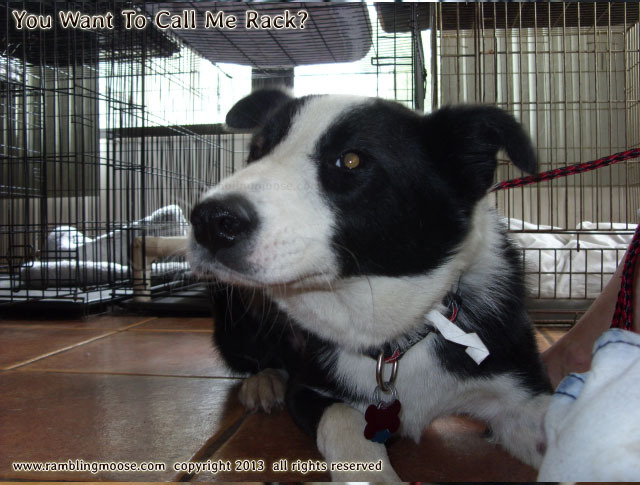 The N.O.A.H Animal Adoption Spay and Neuter Center - or Northwest Organization for Animal Help (NOAH) "is dedicated to stopping the euthanasia of healthy, adoptable and treatable homeless dogs and cats in Washington State. We are committed to high quality spay and neuter programs available for low income residents, family friendly pet adoptions, humane education, and volunteer programs through our state-of-the-art facilities and Spay/Neuter Center." They are based in Stanwood, Washington so if you are thinking about a pet you can check out their furry friends that are available or check out their photo tour. The picture got me thinking. We have had a very wet week here in South Florida. It has thunderstormed every day for the last week. When it thunders here, it's epic. There was a lightning strike within a block that made all the lights in the house surge brilliant for a bit. That happens each time there's a storm. gun-shy. He's not the bravest of creatures, in fact I'd say that he's probably the most fearful dog I have ever known. Each time the storms would approach, he would hide. By approach, I mean within 10 miles. Since the storms have had a habit of hovering off shore and approaching from any direction, it has been a terrifying time for my young friend. Last night was a worst case scenerio. Since it is getting close to the July 4th holiday, there are neighbors that are celebrating. Fireworks are readily available in South Florida, whether legal or not. I saw them in Publix last night when we went for some last minute supplies. There are displays at the gas station, and there just is no way to avoid them. We went out for a walk a little early to avoid an approaching storm. The tropical wave that became Hurricane Arthur just gathered enough strength to send a feeder band of Thunderstorms our way. I spotted it early and we were outside. While the atmospherics were going on, someone decided they'd add to the fun and send off some rockets. It was a very unproductive walk. My right arm was being wrenched from my dog trying to get back home, and had I dropped the leash for any reason I have no doubt he would have run home like a shot. Weather makes it tough to manage your dog. 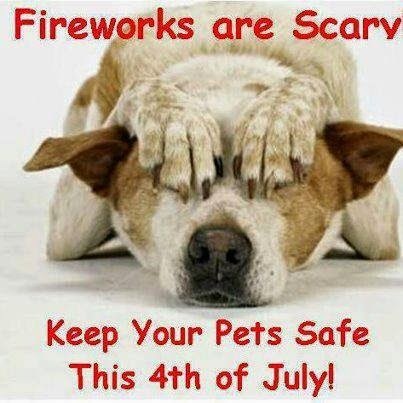 Fireworks can make it even more difficult. Add the two together and we're in trouble. Many people allow their dogs free run of their yards. This kind of noise would make a Jumper out of just about any dog, and in that case you have a terrified animal running for cover in an unfamiliar place. With a dog like that, the best thing to do is what I used to call "Make Storm Time Play Time". Lettie loved tennis balls, so I would play fetch with her during the storms. She liked it so much that any time the weather started up, I came out with the ball and she stopped being fearful. Positive reinforcement. With Rack, it is much more difficult. He loves other dogs, but there isn't one handy. With a dog who loves other dogs, putting him in that social setting would be perfect since the dog he would be with would be a more mellow dog with better confidence. That isn't available, so we're going to have to just let him in his own space. You don't want to let a fearful dog, or even one that seems to be comfortable with the experience. With "amateur displays" a piece of fireworks could go awry and end up closer than anyone would want. In some "distressed areas" someone thinks it would be a great idea to fire guns up into the air. Why they don't remember that that bullet will come down again is beyond me. You're both safer indoors. Once you hear the booms, whether fireworks, guns, or weather, your best bet is to go inside. Or ... Duck and Cover.